Besides their use for various musical reasons, octaves can be a great help in learning the names of the notes on the neck. If you know the names of the notes on the 6th and 5th strings, you can find the name of the notes on other strings by using octaves. If you don't know the names of the notes on the 5th and 6th strings, have no fear, learn here. Octa is the Greek word for eight. An octave is a note that is 8 steps above, or below a giving note in a major scale. 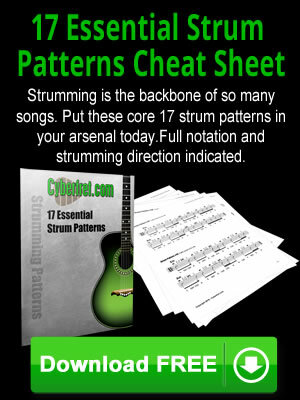 Read these charts of octave shapes the same way as a chord chart. Use this shape when finding a note on your 4th string. Use this shape when finding a note on your 3rd string. Use this shape when finding a note on your 2nd string.